Australia's family law allows the parties to marriages and de-facto relationships to enter into agreements about what might happen if their relationship ends in a separation. 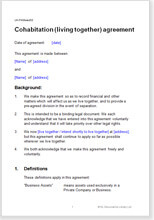 These sorts of agreements are referred to in the law as Binding Financial Agreements. It is the requirement of the Family Law Act 1975 that both parties must receive independent legal advice before signing the agreement. If both parties have failed to do so then the agreement will not be legally binding. Under section 90UB/90UC of the Family Law Act 1975 Act de facto couples can now make a financial agreement that will protect their assets and financial resources. This document does not require any particular action after completion. Just print two copies, get certified by a solicitor that you have taken advice, both of you sign both copies, date both with same date and each keep one. Your completed document is valid and binding at law until you are married or a child is born.